Don’t look for braces in a gift horse’s mouth, they say! Along comes, in a nicely thumping gallop, the latest grime compilation from Ninja Tune‘s off shot Big Dada compiled by none other than writer / A&R extraordinaire Joe Muggs. Adding “2.0” to the title should set it aside from all the retrospective compilation that have popped up recently (the outstanding Ruff Sqwad compilation, a classics compilation on Rinse, and others). Quite obviously, Grime still has a musical and cultural relevance in 2013. The neon synths that grime sported can be found anywhere these days. Giving props to early grime and calling it an important influence is common practice among the young and upcoming producers of today. New releases of any genre are sold with reference to Ruff Sqwad or the eski-versum. Aspirant producers from around the world try their hands at the grimy stuff, hoping to deflect the attention of labels and important blogs to their soundcloud. Grime has detached itself from the pirate radio and MC roots and has become a globalized catchword. Let’s tighten the saddle strap and check out “Grime 2.0”! 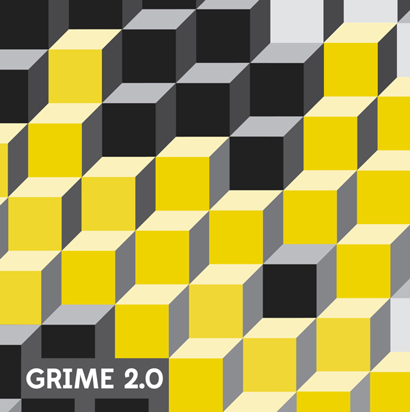 The title “Grime 2.0” makes the obvious link to the first wave of grime tunes in the noughties, or what some conservatives now already label “golden era grime”. And we accordingly find a good number of tunes on the 2 CD compilation produced by old-time big names. Wiley’s there, and Youngstar and MRK1. A whole bunch of names we’ve heard of quite a bit recently like Spooky, Royal-T or Starkey. Add Tre Mission from Toronto and Matt Shadetek from New York for a lightly tossed salad with international seasoning. We find some big heavy beats with the obligatory square waves and octave jumps. The “boing” bassdrum from Youngstar’s “Pulse X” is another brand recognition feature and makes its appearance. Influences from trap and US hip hop are obvious. Form dubstep, too. Cut-up and pitched vocal samples a gogo of course. Overall with an emphasize on the heavy side of beats, which will make for some good moves on the dancefloor. There sure is great music on this compilation! Still, we miss some of the most interesting producers of the last years – an S-X or Kid D beat would surely have added value to the lot, a Samename tune would have made for some melodic absurdity. But as mentioned, don’t look for grills in a gift horse’s mouth … or however that saying went. This is a galloping race here, and not dressage! Mix of the Day: Uproot Andy "Worldwide Ting Mixtape"